In clinical practice, high-dose-rate (HDR) 192 Ir and 60 Co brachytherapy sources are used. 192 Ir sources are most commonly used, but the use of 60 Co sources has increased because of its longer half-life (5.25 years) and its availability in miniaturized forms (with dimensions comparable to those of 192 Ir HDR sources). The Ralstron remote after-loader which uses type 1, type 2 and type 3 60 Co HDR sources, was introduced for intracavitary treatments because of the longer half-life. Presently, BEBIG HDR 60 Co brachytherapy sources (old and new designs) are in widespread use for intra-cavitary treatments. , In a recently published study by Richter et al.,  the authors have compared the physical properties of 60 Co and 192 Ir HDR sources. They demonstrated that the integral dose due to radial dose fall-off is higher for 192 Ir than for 60 Co within the first 22 cm from the source. At larger distances, this relationship is reversed. Their study suggests that no advantage or disadvantage exists for 60 Co sources compared with 192 Ir sources with regard to clinical aspects. However, there are potential logistical advantages of 60 Co sources because only 33% of the activity of 192 Ir sources is needed to yield an equivalent dose-rate. Further, because of relatively long half life, 60 Co sources can be used for much longer duration resulting in reduced operating costs. The Sievert integral algorithm is generally used in RTPS for dose calculation around brachytherapy sources. For 125 I, 169 Yb, 137 Cs and 192 Ir brachytherapy sources, such analytic methods have already been established. ,,,,,,,, Our objective in the present study was to develop a simple analytic tool for calculating the 2D dose-rate distribution in water for the new model (Co0.A86) of a BEBIG 60 Co HDR source. Using the analytic model, we calculated AAPM TG-43 dose parameters such as the dose-rate constant, radial dose function and anisotropy function for the above source in a 50-cm radius in an unbounded water medium. 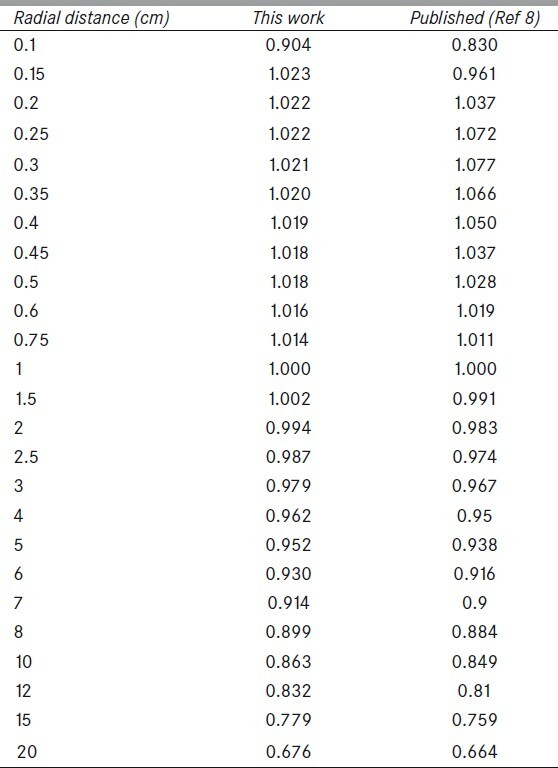 We also calculated the dose-rate look-up table in a Cartesian format. A comparison was made with previously published work. The dose-rate data calculated with the use of the proposed analytic model could be used for verifying the results of treatment-planning systems or directly as input data for RTPS. Analytic calculations were performed for the new model of the BEBIG 60 Co HDR (model Co0.A86) brachytherapy source [Figure 1]. The new BEBIG 60 Co HDR brachytherapy source  is very much similar, both in materials and design, to the old BEBIG 60 Co HDR brachytherapy source (model GK60M21). The new source design has a smaller active core of diameter 0.5 mm with a rounded capsule tip, whereas the old design has an active core of diameter 0.6 mm. The new source has a more rounded capsule tip. Both sources consist of a central cylindrical active core of length 3.5 mm, which is made of metallic 60 Co. The active core is covered by a cylindrical stainless-steel capsule with an external diameter of 1 mm. Here, the air-kerma strength, Sk , is defined as the product of the air-kerma rate measured at a calibration distance r c along the transverse bisector of the source in free space and the square of the distance r c. Sk has units of U (1U=1 μGy m 2 /h = 1 cGycm 2 /h). The dose-rate constant, Λ, is defined as the dose-rate per Sk along the transverse source bisector at the reference distance r 0 = 1 cm. The reference angle, θ0 defines the source transverse plane, and is specified to be 90 0 or /2 radian. Λ has the units of cGy/h/U, which reduces to cm. where A denotes the activity of the source (in Bq), E is the energy emitted by the source (in MeV) per photon, k is the constant converting the unit MeV/gm to the mass energy absorption coefficient of water in units of cm 2 /gm for photon of energy E, and B is the energy-absorption build-up factor. B is defined as the absorbed dose-rate from both the primary and the scattered photons in an infinite water medium divided by the absorbed dose-rate from only primary photons. The assumption made in equation 7 is that the energy lost by photons in the scattering and absorption events is absorbed locally in the medium. This means that the range of secondary electrons (photo electrons, compton electrons and delta-rays) is assumed to be negligible. In the energy range relevant to brachytherapy sources, this assumption has little impact on the calculated dose-rate. where is the mass-energy absorption coefficient of air for the energy E. It should be noted that S k is expressed in terms of the recommended unit U (= 1 cGycm 2 /h). Here, f(r0) = 0.9864 is calculated at r0 = 1 cm with the use of Mesiberger's polynomial  for f(r). In our analytical model, we make use of equation 13.
where, r is the distance between the center of the active length and the point of interest (r, θ). In equation 15, an assumption is made that the entire activity is concentrated at the geometric center of the cylinder. The influence of the activity distribution in the cylindrical volume is taken into account separately by use of the line-source-based geometry function, GL(r,q). A simple calculation for a cylindrical bare active 60 Co source of 3.5 mm length and 0.5 mm diameter (these are typical active dimensions of the new BEBIG 60 Co source) by using equations 14 and 15 give a dose-rate value of 4.23 cGy/h/U at 5 mm along the transverse axis of the source. This suggests that equation 15 can be used for dose calculations. where with being the distance between the i th Monte Carlo generated point and the calculation point (r, θ). The Monte Carlo values of Gex(r,θ) at distances 1, 2 and 5 mm from the source center along the transverse axis (q = 90°) are larger only by 1.23%, 0.5% and 0.1%, respectively, when compared with the corresponding values of GL(r,θ). In the quantization method, the active part of the cylindrical source is divided into N source elements, which are treated as point sources. For each elemental source, the dose-rate is calculated by multiplying and correcting for the inverse square of the distance, tissue attenuation, self-absorption and filter attenuation by use of an exponential correction over the line between the elemental source and the calculation point. Symbols in equation 17 have the following meaning: μs , μf and μw are the linear attenuation coefficient of the active source, of the filtration material and of water, respectively. t 1 and t 2 are the active radii of the source and the encapsulation thickness, respectively. , and are the distances traveled by photons within the source core, filter material and the water medium, respectively, and is the distance between the center of the source and the calculation point P(r, θ). Photon paths in different media are depicted in [Figure 2]. Equation 21 is a general expression for the dose-rate constant of a monoenergetic photon source of active length L.
We have adapted the analytical tool described above for calculating dose-rate distributions in water around the new BEBIG 60 Co HDR source. We used equation 19 for this purpose. The lengths of stainless steel cable considered in the analytical calculations are 1 mm and 5 mm. Dose-rate calculations are carried out as functions of polar coordinates (r, θ) and Cartesian coordinates (y,z). In the calculations, the radial distance r is varied from 1 mm to 14 cm (in 2.5- mm intervals up to 3 cm and 1-cm intervals from 3 cm to 14 cm), and the polar angle θ is varied from 0° to 179° (in 2° intervals) for each r, with the 180° angle referring to the source cable side. Most of the currently available RTPS make use of the Sievert algorithm  to generate dose distributions for filtered line sources. Frequently, the RTPS, based on this algorithm, does not produce accurate calculations  for the regions close to the source axis. TG-43  recommends treating the attenuation coefficients as parameters of the best fit for minimizing the deviations between the Sievert model predictions and the other calculated results. 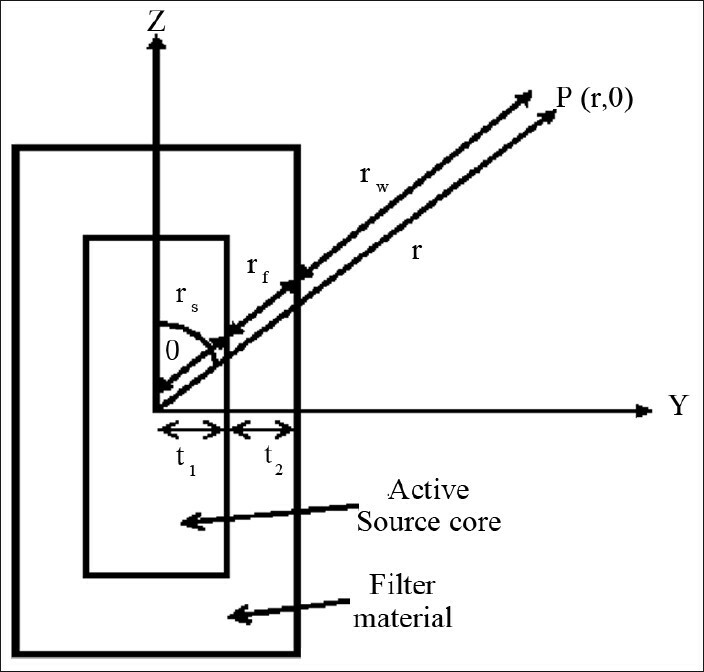 Self-absorption by the source core (μs ) and attenuation by the filtration material (μf ) to be used in such algorithms are generally derived by comparing the dose results with the Monte Carlo results. For example, Ballester et al. and Casal et al. adapted this approach in their Sievert integral-based 137 Cs dosimetry and derived best-fit parameters for μs and μf . Similarly, Pérez Calatayud et al. derived best-fit parameters for μs and μf in their quantization method-based dosimetry study on CDC-type miniaturized 137 Cs sources  and the best-fit parameter for μ for 192 Ir wires. 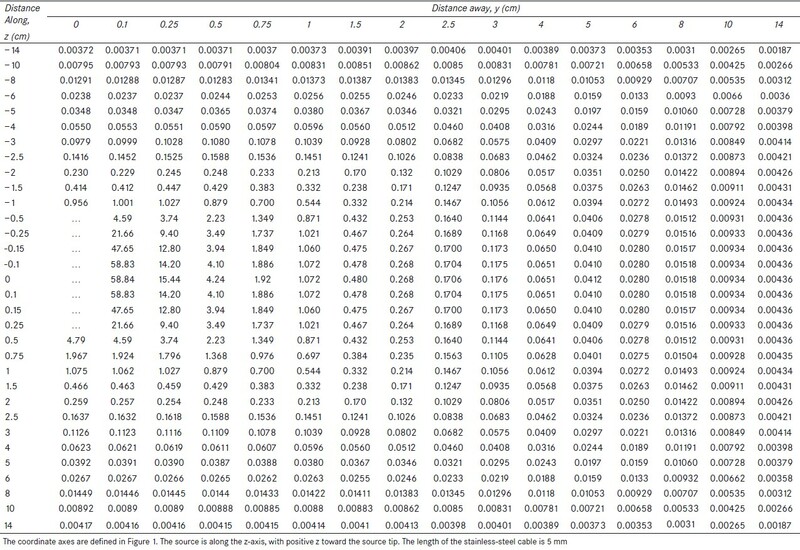 [Table 3] compares the values of gL(r) for BEBIG 60 C sources calculated in the present study and the EGSnrc-based published work. At r = 2.5 mm, the EGSnrc-based published value  is higher by about 6% when compared with the value obtained in the present work. This is because the analytic calculation considers that there is charged particle equilibrium for all calculation points, including for regions close to the source. 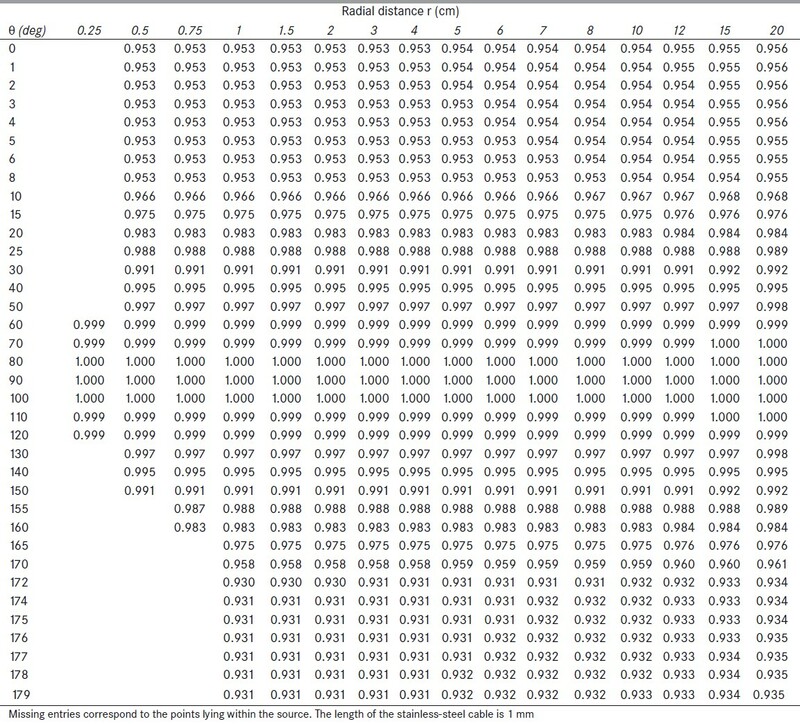 [Table 4] presents values of the anisotropy function for various radial distances from the source. 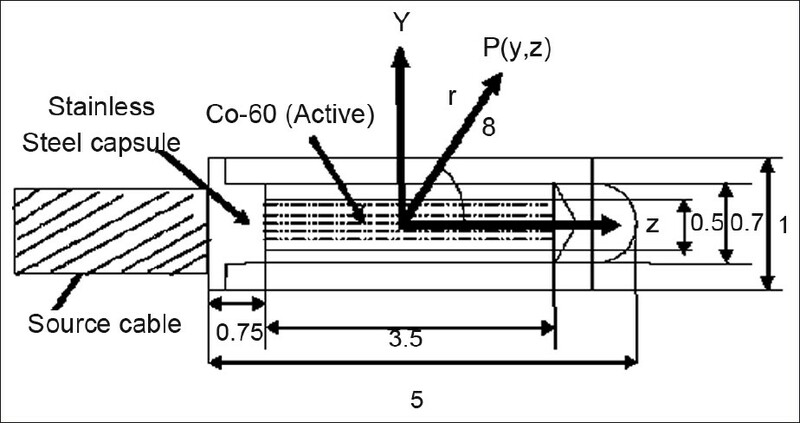 The source cable length considered in this calculation was 1 mm for comparison with values published by Granero et al. The analytically calculated data compares with the published data within 3%. [Table 5] and [Table 6] present the 2-D dose-rate distribution in water (in cGy/h/U) for the new source model with 5-mm and 1-mm-length stainless-steel cable, respectively. For the 1-mm cable length, the analytical data agree with the data published by Granero et al. within 1%, and for the 5-mm cable length, the agreement is within 3%. For regions where charged-particle equilibrium exists, a comparison of these data with the corresponding EGSnrc-based published data  suggests that the analytically calculated values are comparable to within 0.5% for most points, and the maximum deviation is about 3%. Table 4: Anisotropy function F(r,θ) values for the new (model Co0.A86) BEBIG 60Co HDR source. Table 5: Dose rate distributions per unit air-kerma strength (cGy/h/U) around the new (model Co0.A86) BEBIG 60Co HDR source. Table 6: Dose rate distributions per unit air-kerma strength (cGy/h/U) around the new (model Co0.A86) BEBIG 60Co HDR source. We have proposed a point-source-based simple analytic method for calculating the dose-rate distribution in water in units of cGy/h/U for a BEBIG 60 Co HDR source. Using this method, we calculated TG-43 parameters such as the dose-rate constant, radial dose function and anisotropy function. 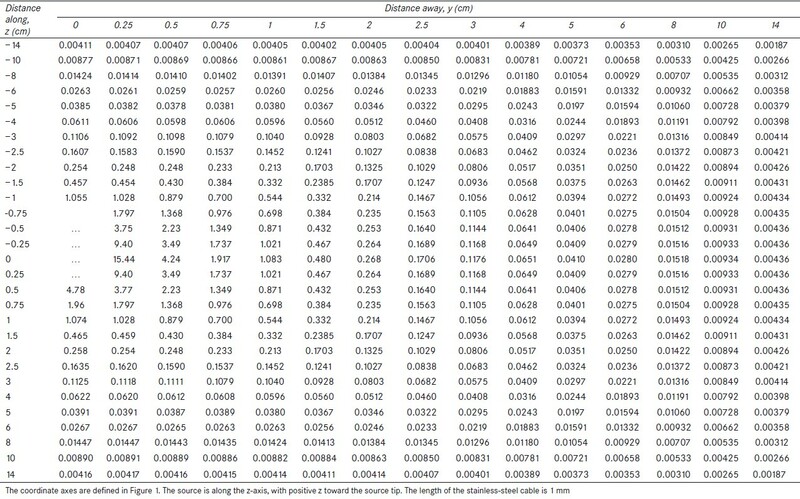 We also calculated a 2-D dose-rate table in Cartesian format. The proposed analytic method needed best-fit parameters for linear attenuation coefficients of source and filtration materials for regions close to the source axis. The analytic model proposed is easy to implement in radiotherapy treatment-planning dose calculations. For regions where electronic equilibrium exists, a comparison between the analytically calculated and published Monte Carlo-based data shows good agreement (for most calculation points, agreement was within 0.5%, and the maximum deviation was about 3%). The dose-rate data calculated with this method could be used for verifying the results of RTPS or directly as input data for radiotherapy treatment-planning dose calculations. The authors wish to thank Dr. Y. S. Mayya, Head, Radiological Physics and Advisory Division, Bhabha Atomic Research Centre (BARC), and Dr. G. Chourasiya, BARC, for their encouragement and support throughout this project. 1. Papagiannis P, Angelopoulos A, Pantelis E, Sakelliou L, Karaiskos P, Shimizu Y. Monte Carlo dosimerty of 60 Co HDR brachytherapy sources. Med. Phys.2003;30 : 712-21. 2. Ballester F, Granero D, Perez-Calatayud J, Casal E, Agramunt S, Cases R. Monte Carlo dosimetric study of the BEBIG Co-60 HDR source. Phys Med Biol 2005;50:309-16. 3. Granero D, Perez-Calatayud J, Ballester F. Technical note: Dosimertic study of a new Co-60 source used in brachytherapy. Med Phys 2007;34:3485-8. 4. Richter J, Baier K, Flentje M. Comparison of 60 Co and 192 Ir sources in High Dose Rate Afterloading Brachytherapy. Strahlenther Onkol 2008;184:187-92. 5. Nath R, Anderson L, Luxton G, Weaver A, Williamson F, Meigooni S. Dosimetry of interstitial brachytherapy sources: Recommendations of the AAPM Radiation Therapy Committee Task Group 43. Med Phys 1995;22:209-34. 6. Rivard J, Coursey M, Dewerd A, Hanson F, Huq S, Ibbott S, et al. Update of AAPM task Group No. 43 Report: A revised AAPM protocol for brachytherapy dose calculations. Med Phys 2004;31:633-74. 7. Nath R, Anderson L, Meli A, Olch J, Stitt A, Williamson F. Code of practice for brachytherapy physics: Report of the AAPM Radiation Therapy Committee Task Group No. 56. Med. Phys 1997;24:1557-98. 8. Selvam P, Bhola S. Technical Note: EGSnrc-based dosimetric study of the BEBIG 60 Co HDR Brachytherapy sources. Med Phy 2010;37:1365-70. 9. Sievert M. Die Intensitatsverteilung der prima¨ren gamma-Strahlung in der Na¨he medizinischer Radiumpra¨parate. Acta Radiol 1921;1:89-128. 10. Williamson F. Monte Carlo and Analytic calculation of absorbed dose near 137 Cs intracavitary sources. Int J Radiat Oncol BiolPhys 1988;15:227-37. 11. Williamson F. The Sievert integral revisited: Evaluation and extension to 125 1, 169 Yb, and 192 1r brachytherapy sources. Int J Radiat Oncol Biol Phys 1996;36:1239-50. 12. Lizhong L, Prasad C, Bassano A. Determination of 137 Cs dosimetry parameters according to AAPM TG--43 formalism. Med Phys 2004;31:477-83. 13. Ballester F, Lluch L, Limami Y, Serrano A, Perez-Calatayud J, Lliso A. A Monte Carlo investigation of the dosimetric characteristics of the CSM11 137 Cs source from CIS. Med Phys 2000;27:2182-9. 14. Casal E, Ballester F, Lluch L, Perez-Calatayud J, Lliso F. Monte Carlo Calculations of dose rate distributions around the Amersham CDCS-M-type 137 Cs source. Med Phys 2000;27:132-40. 15. Perez-Calatayud J, Ballester F, Serrano-Andres A, Lluch L, Puchades V, Limami Y, et al. Dosimetric characteristics of the CDC-type miniature cylindrical 137 Cs brachytherapy sources. Med Phys 2002;29:538-43. 16. Perez-Calatayud J, Lliso F, Carmona V, Ballester F, Hernandez C. Monte Carlo calculations of dose rate distributions around 0.5 and 0.6 mm in diameter 192 Ir wires. Med Phys 1999;26:395-401. 17. Pantelis E, Baltas D, Dardoufas K, Karaiskos P, Papagiannis P, Rosaki H, et al. On the dosimertic accuracy of a Sievert Integration model in the proximity of 192 Ir HDR sources. Int J Radiat Oncol Biol Phys 2002;53:1071-84. 18. Karaiskos P, Sakelliou L, Sandilos P. Limitations of the point and line source approximations for the determination of the Geometry factor around brachytherapy sources. Med Phys 2000;27:124-8. 19. Berger J. Energy deposition in water by photons from point isotropic sources. J Nucl Med Suppl 1968;1:17-25. 20. Hubbel H, Seltzer M. Tables of X-ray mass attenuation coefficients and mass energy absorption coefficient 1 keV to 20 MeV for elements Z=1 to 92 and 48 additional substances of dosimetric interest. NISTIR 5632: Gaithersburg, MD: NIST; 1995. 21. Kartha P, Kenney N, Cameron R. An experimental determination of the absorption and buildup factor in water for radium, cobalt 60, and cesium 137 gamma rays. Am J RoenTG-enol 1996;96:66-9. 22. Meisberger L, Keller J, Shalek J. Effective Attenuation in Water of the Gamma Rays of Gold 198, Iridium 192, Cesium 137, Radium 226, and Cobalt 60. Radiol 1968;93:953-7. 23. Van Kleffens J, Star M. Application of Stereo X-Ray Photogrammetry (SRM) in the Determination of Absorbed Dose Values during Intracavitary Radiation Therapy. Int J Radiat Oncol Biol Phys 1979;5:559. 24. Kornelnen R, Young E. Brachythcrapy buildup factors. Br Rodiol 1981;54:136. 25. Angelopoulost A, Perris A, Sakellarioug K, Sakelliouii L, Sarigiannist K, Zarrist G. Accurate Monte Carlo calculations of the combined attenuation and build up factors, for energies (20-1500 keV) and distances (0-10 cm) relevant in brachytherapy. Phys Med Biol 1991;36:763-78. 26. Papagiannis P, Angelopoulos A, Pantelis E, Sakelliou L, Baltas D, Karaiskos P, et al. Dosimetry Comparison of 192 Ir sources. Med.Phys 2002;29:2239-46. 27. Rivard J. Refinements to the geometry factor used in the AAPM Task Group Report No. 43 necessary for brachytherapy dosimetry calculations. Med Phys 1999;26:2445-50. 28. Cassell J. A fundamental approach to the design of a dose rate calculation for use in brachytherapy planning. Br J Radiol 1983;56 : 113-9.